On 30 September 2007, Germany won their second consecutive Women's World Cup, beating Brazil 2-0. In their bid to retain the trophy, the Germans started with an offensive explosion, annihilating Argentina 11-0. But then their dominant defense took over, keeping clean sheets all the way to the final. The only blemish on their campaign was a scoreless draw with England in the group stage. The Brazilians were similarly stalwart. Though they had conceded two goals to Australia in the quarterfinals, they won every match on the way to their meeting with Germany, thanks in part to the seven goals provided by Marta, the tournament's leading scorer. Playing at the Hongkou Stadium in Shanghai, the teams kept each other scoreless through the first half, but German forward and captain Birgit Prinz broke the deadlock with a strike in the 52nd minute. It was her fourteenth World Cup goal overall, making her the competition's all-time leading scorer. Marta had a chance to equalize with a second-half penalty, but German keeper Nadine Angerer saved the attempt. Midfielder Simone Laudehr then cemented the victory in the 86th minute. The 2-0 scoreline was a mirror image of the men's final in 2002, when Brazil took the honors. Prinz retired after the tournament. Marta continued to play at the 2011 and 2015 World Cups, raising her tally to a new record of fifteen goals. On 29 September 1971, Chelsea recorded their widest margin of victory, beating Jeunesse Hautcharage 13-0 in the second leg of their first-round meeting in the Cup Winners' Cup. The tie was effectively over after the first leg, with Chelsea beating Hautcharage, an amateur side, 0-8 in Luxembourg. But the 27,621 people who turned up at Stamford Bridge for the second leg were treated to a match of historic proportions. 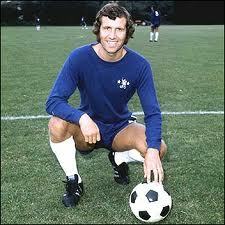 Striker Peter Osgood (pictured) started the scoring deluge, providing the opening goal in the fourth minute, then adding another two minutes later. By halftime, the Blues were leading 6-0 with additional goals from Alan Hudson (11'), John Hollins (13', pen. ), David Webb (23'), and Ron Harris (44'). In the second half, Hautcharage successfully defended their goal until the 61st minute, when Tommy Baldwin increased the lead to 7-0. More goals soon followed, including two more from Baldwin (68', 90'), a second-half hat-trick from Osgood (63', 80', 88'), and one from Peter Houseman (77'). The final score of 13-0 set a single-game Chelsea record and, with a combined score of 21, also beat the previous European aggregate record of eighteen. Unfortunately for Chelsea, their scoring fortune ended in the next round, where they lost to Swedish side Atvidaberg on away goals, 1-1. 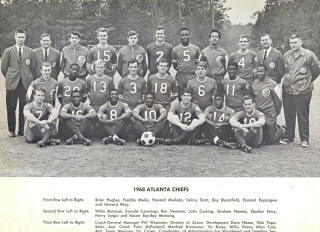 On 28 September 1968, the Atlanta Chiefs won the inaugural NASL title, beating the San Diego Toros 3-0 over two legs in the final. Formed earlier that year from a merger of the United Soccer Association and the National Professional Soccer League (both of which had formed in 1967), the new North American Soccer League divided a total of seventeen teams into four different divisions. They used an unusual scoring system in which teams earned six points for a win, three points for a draw, no points for a loss, and one point (up to three per game) for each goal scored. The Chiefs (pictured) won the Atlantic Division comfortably, while the Toros--who had an identical record as the Oakland Clippers but more goals--won the Pacific Division by a single point. After playoff wins over the Cleveland Stokers and Kansas City Spurs, respectively, the two teams met in the two-legged final. The first leg, played on 21 September, ended as a scoreless draw. But Atlanta took the second leg 3-0 with goals from Peter McParland, Kaizer Motaung, and Delroy Scott. Afterward, Atlanta boss Phil Woosnam was named Manager of the Year and Motaung received the Rookie of the Year award. But not a single Atlanta player was included on the league's All Star Team (which included five Oakland players and only two Toros). On 27 September 2007, the Portuguese Football Federation relegated FC Marco and suspended the club for two years. Not that it mattered. Founded in 1927, Marco spent its entire existence in Portugal's lower divisions. Their best finish was fourth place in the second division, achieved in 2005. But two years later, they were back in the third division, where the 2007-08 season started without them, as they failed to show up for their first four matches. The FPF kept a close eye on the situation after the first missed game and gave Marco a little time to pull things together. By the fourth missed game, however, the FPF had had enough. On 27 September, they issued a formal notice of punishment, dropping Marco into the fourth division and suspending them for two seasons. It was a hollow punishment, however, as Marco never showed up for the fourth division, either. Shortly after the notice, the club dissolved. In 2009, a new club rose to take Marco's place. Called AD Marco 09, they entered the Porto Second Regional Division and began to work their way up the pyramid, earning promotion in their first season. They currently sit at the top of the Porto FA First Division, which is in the sixth tier of the Portuguese pyramid. On 26 September 1943, forward Juan Arza scored a hat-trick on his debut for Sevilla. He went on to become the club's all-time La Liga scoring leader. Twenty years old at the time, the Estella-born Arza had played for Alavés and Màlaga before joining Sevilla. There, in his first official match, his three goals helped them to a 5-2 victory over Sabadell. They were the first of seventeen goals he scored that season as Sevilla finished in third. He remained with them for sixteen seasons, winning the league in 1946 and the Copa del Rey in 1948. His best scoring season was 1954-55, when his twenty-nine goals won him the Pichichi as La Liga's top marksman. 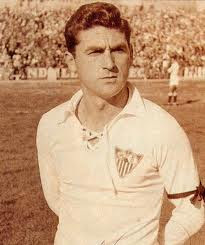 Before leaving Sevilla in 1959, Arza had collected a total of 207 goals. Although that ranks him second in the club's all-time scoring list, behind Guillermo Campanal (218), Arza's league tally of 182 remains the highest in club history. Labels: CE Sabadell FC, Guillermo Campanal, Juan Arza, Sevilla F.C. 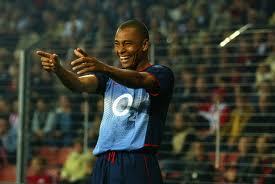 On 25 September 2002, midfielder Gilberto Silva scored a record goal to help Arsenal cruise past PSV in the Champions League group stage. PSV hosted the Gunners in Eindhoven for the game, which was the second of the tournament for both teams. Arsenal took the opening kick-off and Silva immediately raced unmarked down the center of pitch, where he received a cross from teammate Thierry Henry, then knocked the ball into the net. The official time for the goal was 20.07 seconds, making it the fastest goal in European Cup/Champions League history up to that point, narrowly beating Alessandro del Piero's time of 20.12, set in a 1997 match for Juventus against Manchester United. The day did not get any better for PSV. After Arsenal keeper saved their best chance of the day--a 22nd-minute shot from Mateja Kezman--the hosts went on to surrender three more goals to Freddie Ljungberg (66') and Henry (81', 90') and lost 0-4. PSV did better in the return leg, holding Arsenal to a scoreless draw in London, but the result eliminated them from the competition. Arsenal advanced, but were knocked out in the second group stage. Silva's record lasted until March 2007, when Bayern Munich's Roy Makaay scored against Real Madrid after only 10.12 seconds. 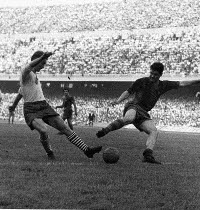 On 24 September 1957, Barcelona inaugurated the Camp Nou with a 4-2 friendly win over a Warsaw select team. Built over a period of three and half years at a cost of 288 million pesetas, the stadium's original name was Estadi del FC Barcelona, but it has been known from the beginning as Camp Nou ("New Ground") (the club officially adopted that name in 2000). For the inauguration, Barcelona hosted a crowd of over 90,000 for the friendly against the players from Warsaw. Several dignitaries attended, including the Archbishop of Barcelona, who blessed the new stadium. A choir then performed the Hallelujah chorus from Handel's Messiah. It took only eleven minutes for the home side to pull ahead, with striker Eulogio Martínez scoring the first goal. Barcelona got additional goals from Tejada, Sampedro, and Evaristo to win 4-2. Since then, the stadium's capacity has increased to over 99,000 and it has hosted European Cup and World Cup matches. 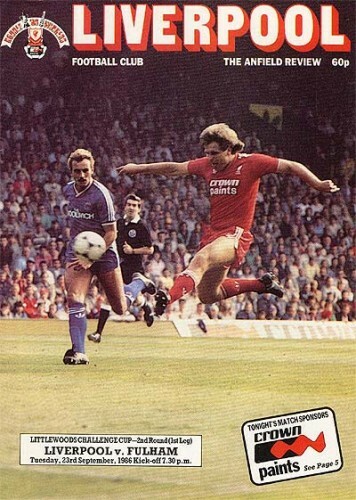 On 23 September 1986, Liverpool matched a League Cup record, beating Fulham 10-0 in the first leg of their second round meeting. The defending league champions, Liverpool had dominated the competition over the previous years, winning it four straight times between 1981 and 1984. They were looking to return to those winning ways after suffering a third-round loss to Tottenham in the 1984-95 season and elimination by Queens Park Rangers in the 1985-86 semifinals. They entered the 1986-87 tournament in the second round, where they hosted Fulham at Anfield for the first leg. The match was played on a Tuesday, drawing a small crowd of only 13,498. Those that turned up, however, were treated to a scoring explosion. Ian Rush provided the first in just the eight minute, followed by goals from John Wark (10', 63'), Ronnie Whelan (28'), Steve McMahon (44', 66', 71', 79'), and another from Rush (76'). Steve Nicol provided the final goal in the 83rd minute to set the final margin at 10-0, matching the record for the highest single-game margin of victory in the League Cup, set by West Ham's win over Bury by the same score in 1983. Liverpool went on to win the second leg 203 and kept up their level of play to advance all the way to the final before falling to Arsenal 2-1. 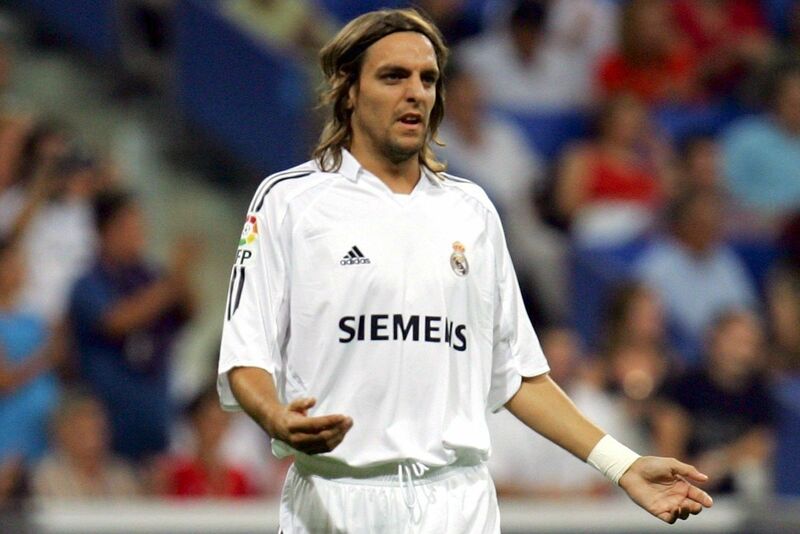 On 22 September 2005, Real Madrid's Jonathan Woodgate used an own goal and a red card to make one of the worst debuts in football history. The defender had joined Real Madrid over a year earlier, completing a £13.4M move from Newcastle in August 2004. But a lingering thigh injury suffered against Chelsea the previous April had kept him out of any competitive matches for his new club until he finally got the call to start in a league contest against Athletic Bilbao. He made his mark in the 25th minute, when he misjudged an attempted clearance and headed the ball into his own net past keeper Iker Casillas. Then, just before the break, he received a yellow card for a challenge on Athletic midfielder Carlos Gurpegi. His day ended twenty minutes into the second half after he received a second booking for a foul on winger Joseba Exteberria. Fortunately for Woodgate, his errors did not impact Real Madrid, who went on to win the match 3-1. But he made only eight more league appearances for them before moving back to England on loan with Middlesbrough, then signing for them on a permanent deal in 2007. Labels: Athletic Club Bilbao, Carlos Gurpegi, Iker Casillas, Jonathan Woodgate, Joseba Exteberria, Real Madrid C.F. 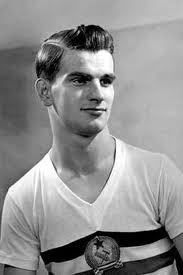 On 21 September 1929, forward Sándor Kocsis was born in Budapest. He went on to become one of the most prolific scorers of the era. He started his professional career in 1945 with Hungarian club Kobanyai, but spent only one season there before moving to Ferencváros. He spent two quiet years before his breakout season in 1948-49 when he scored 33 times in 30 league appearances to help the club run away with the title. He gave them another 30 goals in 30 appearances the next season, then moved to Honvéd, where he won three more league titles. His 36 goals in 1952 and 33 in 1954 were European bests for those two years. His scoring form carried over to the national team, where he knocked in 75 goals in 68 appearances between 1948 and 1956. Along the way, he won Olympic gold (1952) and a Central European Championship (1953), as well as reaching the World Cup Final (1954). Honvéd were in Spain for the European Cup when the Hungarian revolution started in 1956, so like many of his teammates, he remained there. He spent seven seasons with Barcelona before his retirement in 1965, though he never reached his previous scoring heights. Later in life, he was diagnosed with stomach cancer and died in 1979 at the age of 49. On 20 September 2011, Fenerbahçe and Manisaspor played in front of a crowd of women and children only. The unusual crowd resulted from a friendly that Fenerbahçe hosted against Shakhtar Donetsk the previous July. Several home supporters invaded the pitch, prompting the Turkish football association to take action. 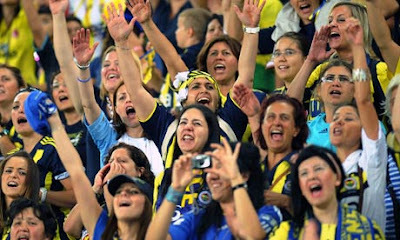 They originally ordered Fenerbahçe to play two of their home matches behind closed doors, but later decided to allow a crowd of women and children. More than 41,000 of them turned up for the match, with players from both teams tossing flowers into the stands. The match ended as a 1-1 draw, but Fenerbahçe captain Alex De Souza said afterward "This memory will stay with me forever. It's not always that you see so many women and children in one game." On 19 September 1926, Milan and Inter inaugurated the San Siro with a friendly. Inter won, 3-6. Although the two teams share the stadium now, it originally belonged to Milan. The idea for the new stadium came from club president Piero Pirelli, who also funded the 5 million lire construction cost. Contrary to the multi-use model of most Italian grounds at the time, architect Ulisse Stacchini rejected the inclusion of a track surrounding the pitch in order to create a more intimate setting for the stadium's capacity crowd of 35,000. 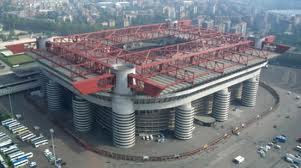 Named the New San Siro Football Stadium after the district in which it is located, the new stadium did not have an auspicious start for Milan, as they lost that first match to Inter, 3-6, then lost their first league match there as well. The club sold the stadium to the city of Milan in 1935, but the Rossoneri remained the sole occupant until 1947, when Inter became joint tenants. In 1980, it was offiicially renamed after Milan and Inter star Giuseppe Meazza, but it is still commonly referred to as the San Siro. It has since undergone several expansions and currently holds a capacity of 80,018. 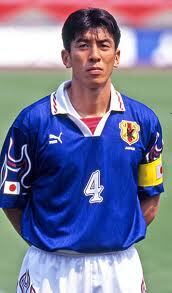 On 18 September 1967, defender Masami Ihara was born in the Japanese town of Minkuchi. We went on to make a then-record 122 appearances for the men's national team between 1988 and 1999. Ihara received his first cap at the age of 21 while playing for the University of Tsukuba and made five national team appearances in that first year. Upon graduation, he joined the Nissan Motors team (which later became known as Yokohama Marinos) and remained there until 1999. In between, he made another 117 national team appearances, including their title-winning run in the 1992 Asian Cup and, in 1998, their first World Cup. His record of 122 remains a record for the men's team, but is second to Homare Sawa, who was capped 186 times for the women's team. At the club level, Ihara won the J-League with Marinos in 1995, a season in which he was also named the Asian Footballer of the Year. After one season with Júbilo Iwata (2000) and two with Urawa Red Diamonds (2001-02), Ihara retired and moved into coaching. His 122 caps remained a team record until October 2012, when he was passed by Yasuhito Endō. Ihara currently sits in second place on the appearances table after Endō's 152 caps. On 17 September 2011, Premier League debutants Swansea City became the final team across the top four divisions of English football to score a goal that season. Playing in their first-ever Premier League season (and their first one in the top flight since 1983), the Swans had gone scoreless in their first four matches, getting draws with Wigan and Sunderland in between losses to Manchester City and Arsenal. By the time they hosted West Brom at Liberty Stadium for their fifth match, Swansea were the only team across the Premier League, the Championship, League One, and League Two--a combined 92 teams in all--without a goal to their name. That changed quickly against West Brom, with Swansea forward Scott Sinclair (pictured) delivering from the penalty spot in the 14th minute. It was the first goal scored by a Welsh team in the English top flight since Swansea's Bob Latchford netted at Old Trafford in May 1983. But they didn't stop there, as Leroy Lita extended Swansea's lead in the 24th minute, then Nathan Dyer added a third in the 49th to cap the 3-0 victory. Swansea went on to pull a double over West Brom that season en route to an impressive 11th-place finish the final table. On 10 September 2010, FAR Rabat goalkeeper Khalid Askri committed a blunder that made him an instant internet celebrity. It happened during a Coupe du Trône match against FAR Rabat's Moroccan league rivals, Maghreb Fez. Askri and his counterpart had done well to keep the match scoreless to force a decision by penalty shootout. There, Askri did well to parry a shot by a Maghreb player. After knocking the ball away, he jumped to his feet and faced the stands, pounding his chest. But he failed to notice that, after landing outside the goal, the ball's spin carried it in. The shooter noticed it, however, and brought it to the attention of the referee, who awarded the goal. Maghreb went on to win the shootout, 0-0 (7-6). Askri's mistake hit YouTube shortly afterward and immediately went viral, with over a million views in the first week. But Askri's notoriety did not end there; just a few days later, an opposing player robbed the ball from his feet inside the box and scored, prompting Askri to storm off the field in a scene that earned him even more YouTube views. Maghreb, meanwhile, advanced to the Coupe du Trône Final, where they lost to FUS de Rabat. 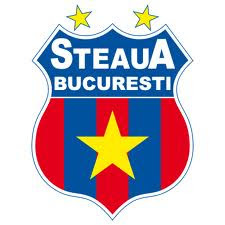 On 9 September 1989, Steaua Bucureşti lost their first domestic match in over three years when rivals Dinamo Bucureşti finally ended their unbeaten streak at an incredible 119 games. That run stretched back to the first match of the 1986-87 season when Steaua, who already were the defending Divizia A and European Cup champions, beat Argeș Pitești 1-0 on opening day. Led by midfielder Gheorghe Hagi, who had signed for them the previous winter, they went undefeated that season, winning the league with a record of 25 wins and 9 draws. They also won that season's Cupa României, beating Dinamo in the final. They repeated their undefeated double the next season (including a league record of 30 wins and 4 draws and a belated cup win over Dinamo after Steaua walked out of the final in protest of a decision by the referee to disallow one of their goals), then completed another unbeaten double in the 1988-89 season (with a league record of 31 wins and 3 draws and a third consecutive win over Dinamo in the Cupa României final). After winning their first two matches of the 1989-90 season, Steaua hosted Dinamo on 9 September, where the visitors proceeded to win 0-3. That result ended Steaua's domestic unbeaten run at a staggering 119 matches, consisting of 113 wins and only 16 draws. It remains the longest recorded streak in the history of the sport. On 8 September 1968, Boca Juniors ended San Lorenzo's 26-game unbeaten streak, defeating the defending champions 0-1. 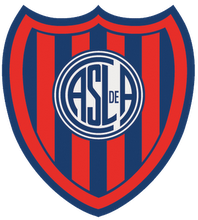 San Lorenzo's run started with the last two matches of the 1967 Nacional competition and extended throughout the entire 1968 Metropolitano campaign, which ended with them as champions--the first time in Argentina's history that a team won a national title without a loss (Racing came close in 1966, losing only a single game). 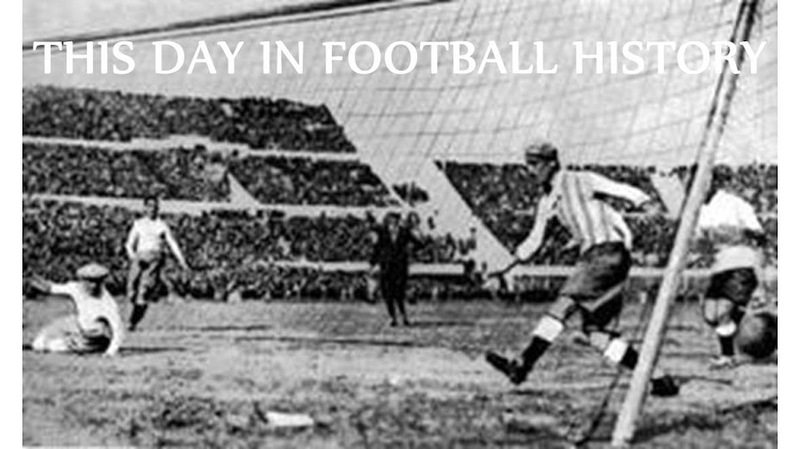 The last contest of the season, a 2-1 victory over Estudiantes in the league final, was their 26th consecutive game unbeaten, matching the streak by Boca Juniors in 1943-44. Coincidentally, San Lorenzo ended that run, beating Boca away, 2-1, so Boca took great pleasure in turning the tables on San Lorenzo with an away win of their own over the title holders in the first game of the 1968 Nacional. At the time, the record unbeaten run in Argentina was 39, set by Racing from 1965 to 1966, but Boca Juniors went on to beat that in 1998-99, setting the current record at 40. On 7 September 1977, Liverpool midfielder Ian Callaghan made his third England appearance--a record 11 years and 49 days after his previous one. 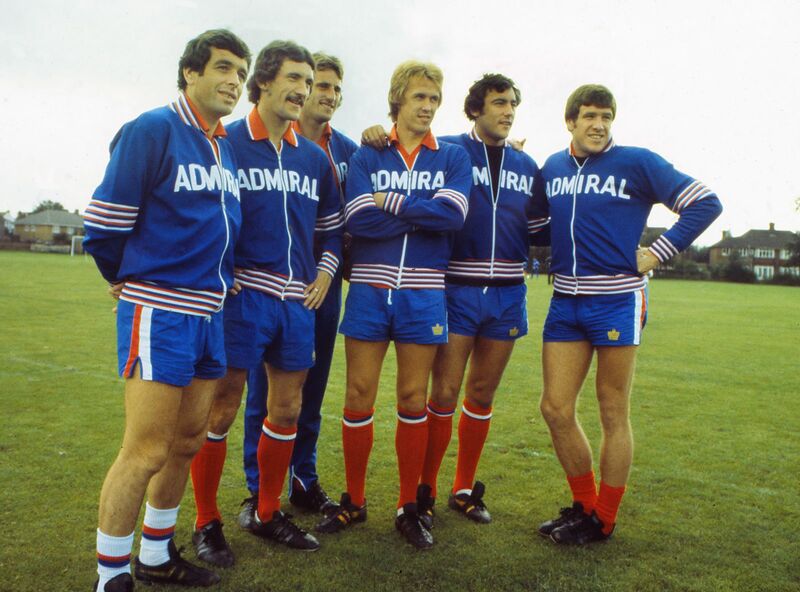 A Liverpool player since the start of his professional career in 1960, Callaghan (pictured at far left) earned his first England cap at he age of 24 in a June 1966 friendly against Finland (England won 3-0). His second came the following month in the World Cup, as England beat France 2-0 in the group stage. It was his only appearances of the tournament, which England went on to win. Although his failure to take part in the final meant that he did not receive a winner's medal at the time, he eventually received one in 2009, along with all of the other squad members. Despite his perfect record, he then went over a decade without playing for the national team. He continued to star for Liverpool, however, winning a total of five league titles, two FA Cups, two UEFA Cups, and two European Cups between 1964 and 1978. In 1977, after missing England's previous 108 games, he returned to the national team for a friendly against Switzerland, which ended as a scoreless draw. The gap of 11 years and 49 days between caps remains an England record. He made a fourth and final appearance the following month in a 2-0 win over Luxembourg. On 6 September 1978, former Japan national team captain and FIFA World Player of the Year Homare Sawa was born in Tokyo. She started her footballing career at the age of thirteen with L.League champions Yomiuri Beleza, making thirteen appearances for them in 1991. She remained there for a total of ten seasons, scoring 79 goals in 136 appearances while winning league titles (1991-93). She spent two more spells with Beleza from 2004 to 2009 then again in 2011, winning another six league titles. In between, she played in the United States for the Denver Diamonds (1999), Atlanta Beat (2001-03), and Washington Freedom (2009-10). Sawa received her first call-up to the Japanese national team in 1993 and played a key role in their run to the quarterfinals in the 1995 Women's World Cup. She starred for them in the next four World Cups, and eventually captained them to the trophy in 2011 with a win over the United States on penalties in the final. That performance helped her win the 2011 FIFA Women's World Player of the Year Award. She won silver with Japan at the 2012 Summer Olympics, then announced her immediate retirement from international football. 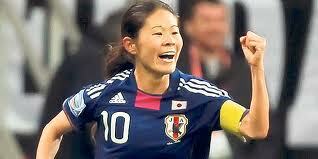 She played club football in Japan for Kobe Leonessa from 2010 until 2015, when she retired completely. On 5 September 1931, Celtic goalkeeper John Thomson died after colliding with a player during an Old Firm match. He was 22. Thomson signed with Celtic in 1926 at the age of 17 and, by February 1927, he had become the team's first-choice keeper, helping them win that year's Scottish Cup. Only 5 feet 9 inches tall, he was small for the position, but made up for it with an impressive leaping ability and a willingness to challenge for any ball. His assertive style of play led to severe injury in 1930, as a diving save left him with a broken jaw, several cracked ribs, and two lost teeth. In that same year, he received his first call-up to the Scottish national team. Then, in September 1931, an undefeated Celtic visited Ibrox to play Rangers in the first Old Firm derby of the season. Early in the second half, with the match scoreless, Thomson went for a loose ball and collided with Rangers striker Sam English, whose knee struck the keeper in the head. The incident left Thomson with a fractured skull and a ruptured artery. He was rushed to the hospital where he underwent an operation to reduce swelling in his brain, but it was unsuccessful and he died later that night. Approximately 30,000 people attended his funeral in Cardenden, with many of them reportedly walking there from Glasgow, 55 miles away. On 4 September 1955, Sporting hosted the first European Cup match, drawing 3-3 with Partizan in Lisbon. Gabriel Hanot, editor of the French magazine L'Equipe, spurred the creation of the tournament, originally named the European Champions' Club Cup. The magazine selected sixteen initial participants--each from a different country--chosen to represent a cross-section of the best European clubs (though some of their preferred teams, such as Chelsea, declined the invitation). They were then placed them directly into a two-legged knockout round. Sporting were chosen from Portugal despite finishing the previous season in third place. Partizan had fared even worse, finishing fifth in the Yugoslavian league. 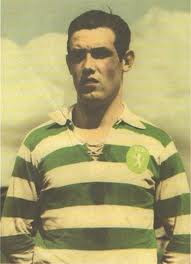 A crowd of 33,000 watched that first match, played at Lisbon's Estádio Nacional, and were rewarded when Sporting midfielder João Martins (pictured) scored the opening goal in the 14th minute. Partizan winger Miloš Milutinović equalized in the 45th minute, then put the visitors ahead five minutes later. At the same time, the referee compounded Sporting's frustration, ejecting defender João Galaz from the match. Despite being down to ten men, Sporting drew level with a 60th-minute goal from winger Joaquim Almeida, then fell behind again after a Partizan forward Stjepan Bobek in the 73rd before Martins salvaged a draw, scoring his second of the day in the 78th minute. Partizan went on to win the second leg 5-2 on 12 October (with Milutinović scoring four) to advance to the quarterfinals, where they lost to eventual champions Real Madrid. 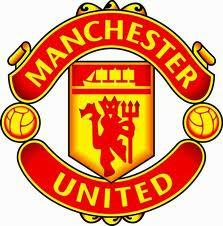 On 3 September 1892, Manchester United played their first league match, losing 4-3 to Blackburn Rovers. Although it was an inauspicious start to an inauspicious season, United have since become the league's most decorated team, winning the title a record twenty times. For the first season, the club still went by their original name of Newton Heath. Founded in 1878, they attempted to join the Football League upon its creation in 1888, but were rejected for four years. Finally admitted for the 1982-93 season, they opened the campaign away at Blackburn where they lost 4-3. They proceeded to go winless for their next five matches, losing another three and finished the season dead last in twentieth place. But they avoided relegation by beating Small Heath FC (later known as Birmingham City) in a playoff. Their next season, however, did see them drop into the Second Division for several years before finally returning in 1906 and winning their first league title in 1908. Since then, they have increased their total to 20, with their most recent title coming in 2013. Labels: Birmingham City FC, Blackburn Rovers F.C., Manchester United F.C., Newton Heath F.C. 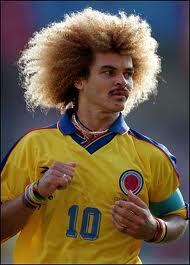 On 2 September 1961, midfielder Carlos Valderrama was born in Santa Marta, Colombia. He went on to become the national team's appearance leader with 111 caps. Nicknamed "El Pibe" (the Kid) and easily recognized for his bushy blonde perm, Valderrama started his career with Unión Magdalena in 1981. By 1985, he was with Deportivo Cali and made his national team debut in a 3-0 loss to Paraguay and went on to captain the team for three successive World Cups (1990, 1994, 1998). In the 1990 World Cup, he provided the assist for a stoppage-time equalizer against West Germany to send Colombia into the Round of 16 for the first and only time. He retired from international play after the 1998 tournament, having made a record 111 appearances. Two years before that, he became one of the high-profile signings for the new American league, MLS, joining the Tampa Bay Mutiny for the league's first season in 1996. He later played for the Miami Fusion (1998), had another spell with Tampa Bay (1999-2000), and then one for the Colorado Rapids (2001-02) before retiring as the league's second-ranked all-time assist leader with 114 (he has since dropped to fourth in the assist table after being passed by Landon Donovan and Brad Davis). On 1 September 1992, the first Championship Manager video game hit store shelves. The series has since become one of the most successful in UK history. The game, written by brothers Paul and Oliver Collyer, was first released on the Amiga and Atari platforms, but soon moved to PCs. Pitched as "the most realistic football management simulation ever," it allowed players to manage teams from the top four divisions in English football through the league and cup competitions (including European tournaments). It initially drew criticism for the lack of graphics, which resulted from the game's focus on managerial decisions instead of match play, but later versions allowed the user to watch the matches unfold. 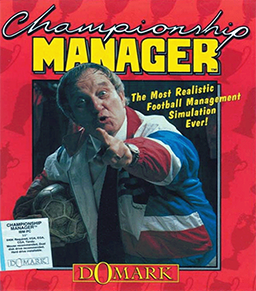 One version, Championship Manager 4, became the fastest-selling PC game of all time in the UK. The Collyer brothers formed their own company, Sports Interactive, to develop the game. In 2004, a split with publisher Eidos Interactive resulted in the Collyers and SI losing the rights to the Championship Manager name. They formed a partnership with Sony and began a separate franchise under the name Football Manager. The two games now compete against each other. In the summer of 2012, in honor of the game's twentieth anniversary, BackPage Press published a book titled Football Manager Stole My Life.